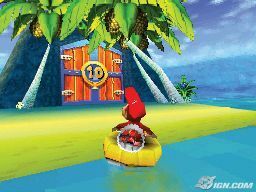 Diddy Kong Racing DS NDS apk android for DraStic free download working on mobile and pc,Nintendo DS EmulatorAfter years of living in peace and harmony, the inhabitants of Timber’s Island are shocked when their tropical paradise is invaded by a giant, hideous space pig! To thwart Wizpig’s nefarious plans, explore the sprawling island, unlock hidden racetracks, and drive, hover and fly against colorful characters in high-octane competitions! 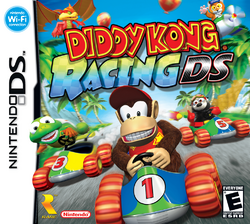 Diddy Kong Racing DS offers three types of vehicles: karts, hovercraft and airplanes. The drivers range from the quick and the small to heavyweights who specialize in bashing rivals off the course. Duel with classic DKR power-ups like oil slicks, gas clouds, land mines, super shields, speed boosts, homing missiles and magnets. You’ll have to speed through a huge variety of racing challenges if you want to unlock all the island’s secrets, complete the adventure and save your friends from the parlous pig.Wish Race mode gives you complete freedom to design, build, and race on the track of your dreams, thanks to excellent use of Touch Screen controls. Nintendo Wi-Fi Connection compatibility lets you share your work of genius with everyone. Of course! Drivers can use Nintendo WFC to go online and race against players from around the world! 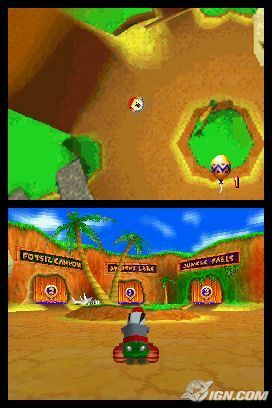 Diddy Kong Racing DS also features multiplayer single-card download play and multicard local wireless play. Create your own multiplayer icon! Choose from a full palette and three kinds of brushes to create a masterpiece that identifies you in the midst of multiplayer madness. Unique touch controls! Spin a tire to get a speed boost off the starting line, and much more! Monkey around with two new racers: Dixie Kong and Tiny Kong! Customization rules! Diddy will make sure you can pull out your (virtual) monkey wrench and upgrade your vehicle’s speed, durability, and appearance. 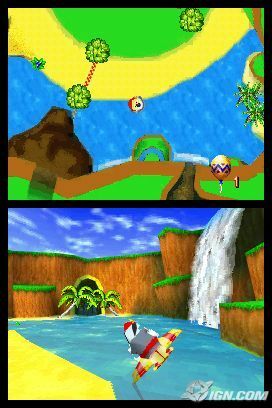 Improved over the N64 version: Faster frame rate, retextured and remixed tracks, new racing challenges, brand new levels, improved vehicle control and more.